I wanted to share with you a most kind letter I have just received. Thank you for this most kind letter about peace and nonviolence exemplified in an artist's rendition of a most expresive bronze statue of Gandhi. I have so enjoyed your book on the statues and public art in the City of Boston. As the founder and director of a small school for special needs children and young adults, I look forward to taking them on field trips to Boston to see as many of the statues as possible as it broadens our appreciation of the history of Boston and elevates our understanding of the importance of public art. In many ways, the statues, plaques and memorials serve "to do the job of cleaning the air of toxins", much as plants do in offices. I was struck by the similarities of your interest in public art and your company, Plantscape Designs, Inc; as both address certain unseen contaminants in our environment. In the case of artistic expression in public art, statues transport us to another time and place with a message that is at once specific and ambiguous ... a journey that requires that our minds be open, attentive and interpretive. Your book does a wonderful job stimulating our interest in what we might discover just around the corner as we walk down the streets in the City of Boston ... and what we might discover within ourselves as we come across works of art that give us pause. And you are so right about the importance of plants in our midst with their healing properties and ability to filter the air we breathe. I am in the process of preparing a proposal to offer as gift to the City of Boston, (through the new Art Czar, Julie Burros), a 9 foot bronze statue ( which I commissioned in 1992) that served to reduce the tension-filled environment and potential for violence within the Occupy Boston encampment. 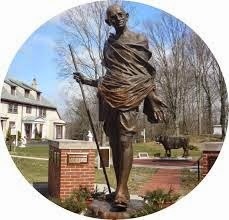 You may have visited the encampment at Dewy Square during the "occupation" period from September 30, 2011 to December 10, 2011 and appreciated the important role the statue of Gandhi made to maintain the peace. It was a replica of the bronze statue we are interested in donating to the City. As we know, the statues in the City are historical markers of events that touched and shaped our lives. The Gandhi statue, and the teachings of Gandhian nonviolence helped to make Boston the most peaceful, longest, continual occupation/protest in the country during the worldwide occupy movement. Protests, as we know, are expressions of a dynamic democracy, and the permanent placement of a statue of Gandhi at Dewey Square will, many believe, serve as an antidote to the potential of violence and unruliness that invariably accompany social unrest and street demonstrations. With protests expanding nationwide over the Grand Jury findings in Ferguson, MO and New York City and elsewhere around the country, it behoves cities to employ public art to promote nonviolence and peaceful expressions of discontent. If you have a moment to visit the Peace Abbey website, you will gain an understanding of the organization's vision and mission. Your point of view would be tremendously insightful and most helpful as we move forward to make a presentation to the Arts Commission. I can be reached at 508-259-8508 to discuss the project if this is of interest. I would be delighted to have the opportunity to meet you at your convenience to discuss the above. Once again, your book is an inspiration to many and a blessing to those who love public art in this culturally rich City on the Hill. I have attached a brief info sheet on the project. Looking forward to hearing from you.